Gloucester Township Police would like to Congratulate Ptl. Centrone and his K-9 partner Zeus and Ptl. 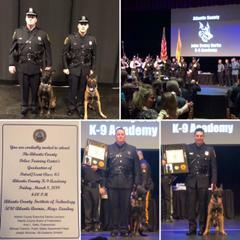 Franz and his K-9 partner Zeke on Graduating from the Atlantic County K-9 Academy Patrol/Scent Class #5 on March 8th, 2019. We wish them a safe, successful, and happy career!